NGC 2174 is an emission nebula on the northern edge of Orion. The nebula is about 40' in diameter, making it larger than the full Moon. 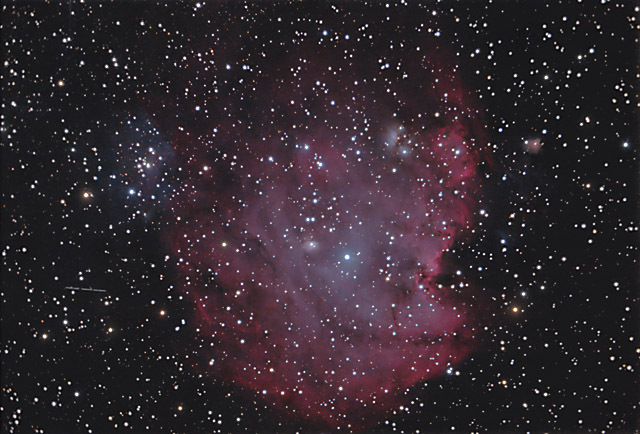 The nebula also contains the open star cluster, NGC 2175. NGC 2174 derives its nickname from its uncanny resemblance to a monkey's head. However, in this image, I have the monkey standing on his head, so it may not be obvious. Amazingly, while photographing the Monkey Head Nebula, I managed to image a total of 5 asteroids. One of the asteroids, 248 Lameia, is readily visible on the left side of the image as a bright, short line. The other asteroids require a more careful search. To see these asteroids in an enhanced image CLICK HERE. Software Used Images Plus 4.0 for camera control, calibration, stacking, digital development, and multiresolution smoothing. Photoshop CS5 used for flat fielding, levels and curves, color balance, high pass filter, star shrinking, saturation adjustments, and noise reduction. Carboni Tools for additional saturation adjustments and star shrinking. Notes I had planned to photograph NGC 2174 all night on 12/28. However, after midnight high clouds moved in and rendered the rest of the night useless. Fortunately, I had enough data to make a pretty good photo. I was very excited to discover that I could image main belt asteroids as faint as Magnitude 18. While asteroids are often an astrophotographic nuisance, capturing 5 of them on a single images seems like somewhat of an accomplishment!